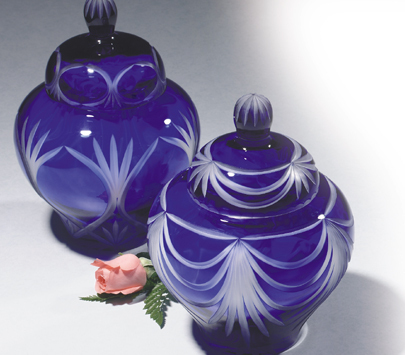 Available in your choice of two exquisite patterns, Angel's Wings (shown left) and Elegant Drape (shown right), these beautiful 24% lead crystal cobalt blue urns have a clear interior, therefore, they come with a white satin bag for cremains. The white bag creates an opaque container for the ashes while at the same time, highlighting the cut designs. Also available in a small size.